Join Leo and his friends on an exciting adventure that welcomes pre-school children to English through colourful stories, action songs and fun arts and crafts. With children's development in mind, this exciting pre-school course introduces the new language through play while improving memory and concentration; practising motor-sensory skills and developing thinking and creativity. Together with Leo, children also discover the fascinating world around them, the link between English letters and sounds, and the importance of sharing and other values. 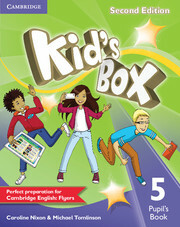 Pupil's Book 1 includes a fabulous DVD-ROM with animated songs and interactive games - perfect for family fun at home.